Very recently, I couldn’t resist purchasing some popsicle molds. They’re called Groovy Pop Molds. Since popsicles are all the rage, I figured that I’d surprise Gerald by making some adult popsicles…Margarita, Mojito, Long Island Iced Tea are the flavors that came to mind. With the cuteness factor of the molds, all of that went out the window when I realized that I had some frozen strawberries and heavy cream on hand. All I could think about was making strawberries and cream popsicles(princess pops) for Alyson. I my heart Alyson is still 5 years old but, in reality she’s almost 17. It’s like that scene from Father of the Bride when Annie tells her family that she’s engaged and all her father can see is a 5 year old saying the words. 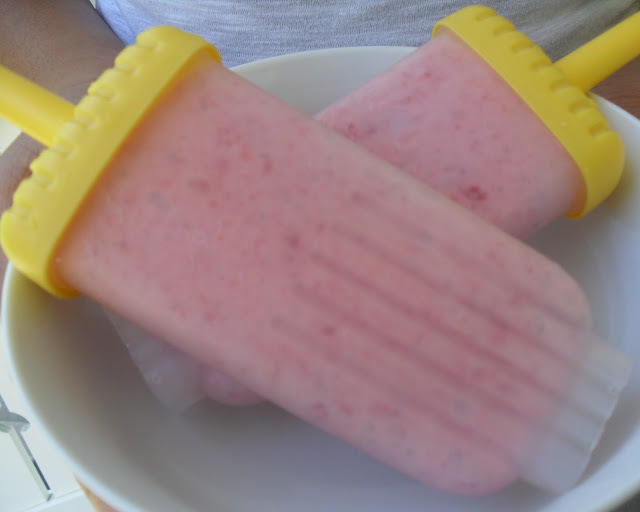 Anyway, whether you’re 5, 17, or 105 you’ll love these strawberries and cream popsicles. They’re packed with strawberries and they’re exceptionally creamy. The frozen strawberries and blender do most of the work for you! In a sauce pan, heat water and sugar in medium heat. Stir to blend and allow mixture to come to a boil before removing from heat. Allow to cool completely before combining with other ingredients. Once cooled, add the simple syrup to a blender along with strawberries, cream, and vanilla extract. Blend until creamy, about 1 minute and 30 seconds, until the mixture is the consistency of soft-serve ice cream. Divide among popsicle forms. Freeze at least 4 hours before unmolding. Note: Don’t want popsicles? This is ready like soft serve as soon as you blend it…just grab a spoon! Yum!!!! I am going to have to get me some molds and make these! We are having a heat wave here with a prediction of 107 this weekend. I’ve been wanting to get some popsicle molds too. These look fab. And I totally relate to your feelings about your princess. Mine just turned 16 and I can’t hardly look at her without wishing she was that raspy-voiced, tutu-wearing, funny little four year old again. How cool and refreshing is this recipe? VERY!!!! Wow, also very pretty!! I recently bought popsicle molds but returned it because it wasn’t as cute as this one. I’ll consider buying this one on Amazon! I’ve been making ice cream but it’s time to move on to Popsicle. We have a lot of fresh sweet strawberries and this recipe sounds really nice!